﻿ Real Madrid 3-0 Wolfsburg. Ronaldo, Ronaldo, Ronaldo! Who else? 12.04.2016 » Real Madrid 3-0 Wolfsburg. Ronaldo, Ronaldo, Ronaldo! Who else? 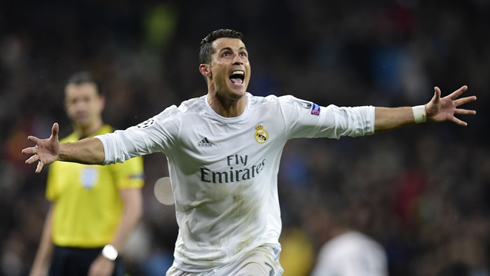 It was one of those magic European nights at the Bernabéu, as Real Madrid took on Wolfsburg for the UEFA Champios League quarter-finals second leg and beat the Germans 3-0 (3-2 on aggregate). The comeback was only possible thanks to a Cristiano Ronaldo hat-trick, which allowed Madrid to secure their spot in the semi-finals for the 6th straight season. The Madridismo had all their hopes on Cristiano Ronaldo ahead of tonight's massive game against Wolfsburg and the Portuguese legend quite simply didn't let anyone down. Real Madrid completed the much-wanted "remontada" to beat Wolfsburg 3-0 tonight and the man on the match was once again Cristiano Ronaldo. In what was certainly one of his most memorable career hat-tricks, the 31-year old crushed the Germans' dreams of advancing to the next round and reached his 16th goal of the season in the UEFA Champions League. The former Manchester United player is now also only one goal short of his own record in the competition (17 goals). This Friday, Real Madrid meets the name of their next opponent in the UEFA Champions League semi-finals. 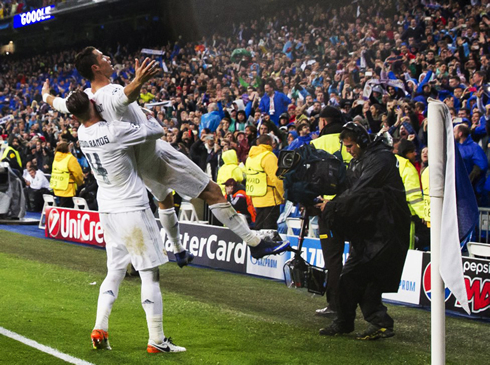 There are few words to describe what was an absolutely magical night for both Cristiano Ronaldo and every Madridista. Two goals within 86 seconds in the first half, coupled with a freekick tie-winner late in the second, was just enough to give Madrid a 3-2 lead on aggregate and secure their passage to the semifinals of the UEFA Champions League. It was the kind of night that will live on forever. A massive performance from a massive player just when his team needed it the most. There are no words to describe this night, but for the "Ronaldo haters", the ones who have harped on him all season for what was deemed his decline, the turn of the year has shown that he is FAR from finished. It wasn't just a hattrick, it was an announcement to world football that Ronaldo is back (as if he ever left). It's easy to make this all about Ronaldo, but Dani Carvajal was brilliant as well. There's no doubt that he has to start every important game remaining. Zidane's impact on this team has been stark as well. There are still some kinks to work out, but everyone is running as if their life depended on it. Zidane has returned the spirit to Madrid and it couldn't have come at a better time. What was once a lost season, an embarrassing one even, is now poised to perhaps be one of the most memorable ones in recent memory. Cristiano Ronaldo next game with Real Madrid for La Liga is on April 16 of 2016, against Getafe. You can watch Juventus live stream, Getafe vs Real Madrid, Atletico Madrid vs Barcelona, West Ham vs Manchester United, Crystal Palace vs Everton, and Benfica vs Bayern Munich, all matches provided from our live streaming football game pages.